The Voices in Our Heads, Michael Aronovitz’s (Alice Walks) new short story collection, is now available and, if you love horror, this is a must-read. I am not normally a fan of short fiction, but Mike’s stories read like tiny novels, alive with character, fully realized, twisted, and full of chills. They’re perfect for ready by the fire while snow flies outside, but be warned: nightmares are guaranteed. I first want to thank Tamara for putting up my little note here! 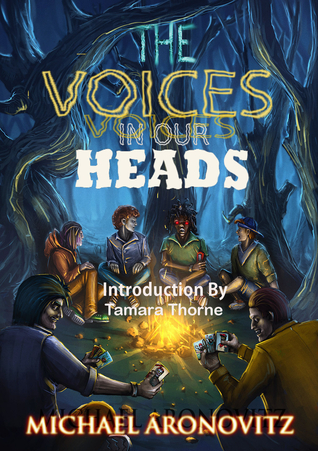 She was kind enough to write the introduction to my latest collection titled The Voices in Our Heads, and I am hoping you might give the book a try! These twelve short stories are themed after the months of the year and split in the four sections: Monsters, Phantoms, Delusion, and Toys. Warning, these stories are VERY DARK! I am no splatterpunk, but would never run away from the staples of the genre. These tales are character driven and disturbing. Initially, I sent Tamara the collection with the hope that she would write a blurb for the back cover. When she offered to write the introduction I was floored! To enter to win a free book, hit the link below.